I didn’t realize how much time had gone by until I posted the latest Wordless Wednesday photo right above the previous Wordless Wednesday photo. I have been doing a bit of crafting in the last week—some knitting and some sewing—but I’ve also had some nasty work deadlines. It is so sad when work gets in the way of the really important things. But yesterday I had a little bit of unexpected extra time, and instead of using it to get a leg up on those deadlines, I started writing this instead. Priorities, right? I recently made two hats (an adult size and a child’s size) from Knitting for Peace by Betty Christiansen. And I also read the book from cover to cover. I don’t usually read knitting books. I collect them, arrange them on my shelf, flip through them, admire the pictures, skim through the instructions, make grandiose plans to knit several stunning or useful items, but I don’t really read them. This book, however, is for reading as much as it is a source of patterns. Christiansen wanted to bring together the stories behind organizations that use knitting to help others “in amazing ways.” And she certainly has found a wide variety of them. As someone who has been crafting for charity for decades now (am I really old enough to say that? ), I knew about a lot of them, but there were many more I had never heard of. No matter what your interests, beliefs, or point of view; no matter what your skill level; and no matter whether you prefer to knit, donate supplies, or buy yarn or handmade items, there’s probably an organization here that will appeal to you. What really got me when I read this book were the stories behind the groups—who started them and why they did it. Usually it was one or two everyday people who had a good idea or had seen firsthand people who need help or had turned their own experience with tragedy into something that helps others. Then, through the generosity of others like them, their efforts grew. And they grew—often into international projects involving thousands of people. Last week I was listening to an interview with Stephanie Pearl-McPhee (the Yarn Harlot) on a podcast from the Lion Brand site. The Yarn Harlot website has raised almost half a million dollars for Doctors without Borders. In this interview, Pearl-McPhee was asked if she thought knitters were naturally more generous than other people. Her theory was that knitters have a better understanding than most of how each little effort contributes to the whole. Any knitted project is made up of hundreds or thousands of little efforts. So for knitters (and other crafters, I’m sure), the making of one hat to cover one head does not seem as insignificant as it might, because we know that when you add up each of those hats, you’ve covered a whole lot of heads. The book contains 15 patterns designed especially for charity knitting. I’ve knit only one so far, but they’re meant to be fairly easy and quick, and many of them are suitable for personal knitting as well. It also includes the websites of several groups that sell yarn, supplies, or items knit by women trying to improve their lives. 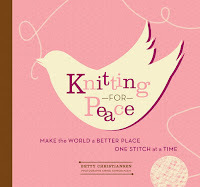 In the first section of the book, Christiansen gives a brief history of wartime knitting in the United States and shares the remembrances of Red Cross knitters (check out the vintage patterns on the Red Cross website!). One strong message that comes through from this section, and from the whole book, is how charity knitting benefits everyone involved—the knitter, the organizer, and the recipient. I knit and crochet, but am always surprised how knitting is referred to more often. Wonder why that is? I've seen some of those old pics, The Red Cross, School kids kniting etc. in several books and they are wonderful to look at. Had to laugh, as I read your description of books, I'm the same with patterns. I have a bunch, I look at them, get ideas but I rarely actually read read it. I'll have to check out this book, you've perked my interest. Stopping in to see what you're working on, to wish you a good week. Welcome mats out. Hi, I work for www.shopyarn.com. Part of my job is to search blogs to find the latest books and shops throughout the U.S.
On shopyarn.com we are going to add patterns and other knitting related books and would like reviews about them. I saw your blog and would like to ask permission to feature the following quote on our site. "Christiansen wanted to bring together the stories behind organizations that use knitting to help others “in amazing ways.” And she certainly has found a wide variety of them. No matter what your interests, beliefs, or point of view; no matter what your skill level; and no matter whether you prefer to knit, donate supplies, or buy yarn or handmade items, there’s probably an organization here that will appeal to you."